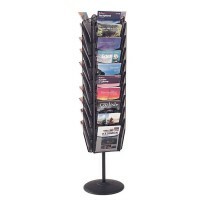 Brighten up your reception area with this stylish literature dispenser. Crafted from premium mahogany wood, it’s perfect for containing print marketing so your counters remain clutter free. 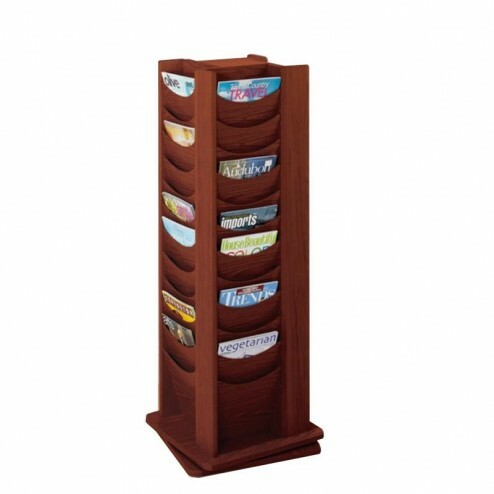 Fully revolving to 360 degrees and containing 48 pockets, display brochures, magazines and other promotional materials with confidence. 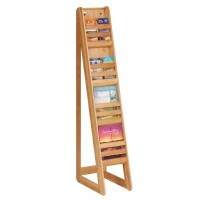 Great for showrooms and public places, or even for trade show display when you need a clear focal point for information. Each pocket is 48mm deep so has generous space for inserts. Quick to replenish, the dispenser design enables speedy collection and inserts are easy to spot. No assembly is required, simply install the literature dispenser where you want. The sturdy construction ensures it won’t topple over when floor space is limited, and the classic design compliments any professional setting. Easy to transport from place to place, it’s a must accessory when you want better display management.